- The onsite restaurant “Bear Moon Bar & Grill” will be closed due to renovations from May 06 – May 09, 2019. Nestled up against the sapphire of America’s largest alpine lake amidst the majestic snow-capped peaks of the Sierra Nevada Mountains, Lake Vacation Tahoe Resort offers a home away from home surrounded by beauty and invested in fun. Ski and snowboard the sloping mountainside in the winter, hike through golden autumnal forests in the fall, spend a week in the casino district (just a mile away!) when the spring showers come, and explore the shimmering lake on jet-ski or boat in the summer. Golfing and wakeboarding, mountain biking and horseback riding- every season is a season of opportunity in the gorgeous Lake Tahoe area. 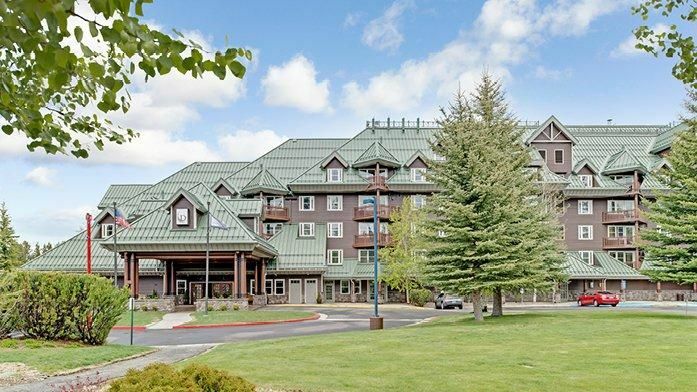 Enjoy the well-appointed amenities of the resort- from the pool, state-of-the-art exercise equipment and steamy sauna to the adjacent adrenaline-inducing Ski Run Marina and Heavenly Mountain Resort Base Lodge. Day or night, rain or shine, you’re bound to find something to enjoy! Come explore the wonder and beauty of nature- with friends, with the kids, with your better half, even solo!- and make memories worth keeping at Lake Tahoe Vacation Resort. Lake Tahoe is California’s masterpiece. The basin of glistening waters and palatial mountains was formed out of calamitous volcanic activity and glacial works of art millions of years ago, giving rise to the astounding tourist attraction of today. Divided into North Lake Tahoe and South Lake Tahoe with equal parts gorgeous, Tahoe keeps locals and visitors occupied all year round. Ski resorts, warm-weather recreation, casinos, reputable nightlife venues, fantastic food, and perfect access to Reno, Carson City and Sacramento all make Lake Tahoe the ultimate vacation. Guest are allowed two vehicles per reservation. Parking options include a maximum of one on-site parking plus one off-site parking space, both vehicles off-site, or use of complimentary 24-hour valet service. On-site parking spaces and valet services are limited and offered on a first-come, first-served basis. Off-site parking is located at our parking structure across the street and adjacent to the shopping center on Paradise Road. Please display the parking permit on the dash of your vehicle while parked in our parking structure. Vehicles not displaying a current permit and/or parked in a No Parking zone will be subject to towing. RVs, boats and trailers are not permitted.
" We had a wonderful time. The room was better than expected. We were in South Lake Tahoe for our youngest daughters wedding, flying in from the east coast and travelling with my 84 year old mother-in-law. The two connected rooms gave all of the privacy and the room to really spread out. The resort was fabulous although we didn’t have the time to use the wonderful facilities; i.e. pool, spa, etc. Perhaps next time and I really hope there is a “next time.” We could not have been happier. The staff was exceptional and the room was in perfect working order. Also, the bed was REALLY comfortable. We slept great each night. We would absolutely stay again." This One-Bedroom accommodation is a spacious 600 sq. ft. and can house up to 4 guests. Discover comfort in accommodations featuring a king size bed and full bathroom. Enjoy the convenience of the partial kitchen equipped with a refrigerator, microwave and coffee maker among many other modern appliances. Additional in-room amenities include cable television, VCR/DVD player, internet, laundry facilities, iron/ironing board and air conditioning. Relax next to a roaring fire while you enjoy a movie from the comfort of your own cozy living room. Soak in the luxurious Garden Tub after a long day of skiing, hiking, and playing outdoors. Enjoy a mug of hot chocolate on your private balcony and savor the crisp mountain air. And when you sink into your sumptuous bed for the night, you'll do so with a smile on your face knowing you'll get to experience it all again tomorrow. Lake Tahoe Vacation Resort boasts far more than a five-star location: indoor and outdoor heated pools, simmering Jacuzzis, easy access to some of the most popular ski runs in Tahoe, lakefront access, a private marina, gorgeous Clubhouse with game room and pool tables, comprehensive Activities Department with fun-filled offering for every age, spa services and more! After a morning of mountain hiking or jet-skiing, enjoy an afternoon grilling session on the resort’s grills while the family sets up in the Picnic Area. Ate too much? Yoga classes and a fully-equipped Fitness Center will help you offset those extra calories if ice skating or trail biking doesn’t do the trick! Enjoy a midday massage while the kids spend some time in the Children’s Club, or relax in one of the simmering hot tubs after a few hours playing in the lake. Dining options include the Bear Moon Bar & Grill which treats guests to delicious grilled dishes alongside fantastic views of Lake Tahoe and the Sierra Nevada Mountains. The adjacent Bar & Lounge is great for watching sports on TV or enjoying a Happy Hour cocktail. Feel free to take your food and drink down to the pool, onto the patio for more panoramic views, or over to the fire pits with family and friends for a cozy late-night get-together! Guests are allowed two vehicles per reservation. Parking options include a maximum of one on-site parking plus one off-site parking space, both vehicles off-site, or use of complimentary 24- hour valet service. On-site parking spaces and valet service are limited and offered on a first-come, first served basis. Off-site parking is located at our parking structure across the street and adjacent to the shopping center on Paradise Road. Please display the parking permit on the dash of your vehicle while parked in our structure. Vehicles not displaying a current permit and/ or parked in a No Parking zone will be subject to towing. RVs, boats and trailers are not permitted. Large, clean space for a family of four with a full kitchen and pull out sofa bed. Convenient to ski slopes and easy access to the lake. The staff is friendly and the facilities were good. Would stay here again for the convenience and quality! Upon my arrival i have given 2 cards for my room and i realized one of them is not working. I went to the front desk and told them about the problem, I have waited in the check in line half an hour and then the lady said that she fixed it. later in the night we went out for dinner and after we came back around 10 pm I could not open the exit door of the building, then I tried another door then another, I could not open it, I walk around to the front desk and again waited in the check in line 15 mins, then the same lady again told me that she fixed it and we went to room again, not working again, I called the front desk from one of those phones in the corridor and she said she is sending security to help us, 10 minutes passed nobody showed up, It was already 10 45 pm and we were still trying to get in to our room, then I walked to the front lobby again, they gave us new keys and this time we walked to the room with the security and you know what the keys did not work again, the security used her own set of keys to let us in to our room. this was one hour wait after a pretty tiring day just to get into our room and to prevent that I went to the front desk in the afternoon trying to get the key fixed. after all this inconvenience I expected maybe a small gesture from the hotel staff the next morning, I`m not talking about a free breakfast or something at least a small we are sorry card would be enough but NOTHING. Thanks for ruining our one night with stupid not working keys and irresponsible front desk staff. Thank you for taking the time to share your recent experience. We apologize for any issues you had at check-in. We take our guest feedback as a way to improve our service and as such have shared your comments with our on-site team. Our on-site team stated that they had recently upgraded their key and lock system for the building including all of the guest rooms. And in your case it could have been an error in the new system when making the keys or the lock on the door itself and sometimes it is just the batteries. Great location. Rooms were decent. Nothing special but the customer service was great, they did move our room when we had issues with our first rooms shower head. Short bike ride to heavenly or the casinos. Walk down to the beach although it was very crowded. Thank you for choosing our property for your stay. We are so happy you enjoyed your stay. The on site team at Lake Tahoe take great pride in their property and it shows. We welcome the opportunity to host you again the next time you are in town. Excellent rooms. Full kitchen, fireplace. Valet service was great. Wifi so so, not very fast. Barely enough to to browse the web. The concierge desk does its timeshare thing, but they weren't overly invasive, but be prepared to them to attempt to lure you to hear their pitch. Overall great property, would stay again. OTHER THINGS TO KNOW - ­­­­­­24 Hour Front Desk - Bell Desk & Valet - Check in Time: 4:00 pm - Check Out Time: 10:00 am - Express Check Out - All Guest Suites are Non-Smoking - Minimum age requirement for check-in is 21 years of age. - No daily turn down and housekeeping service. Weekly housekeeping provided; fees apply for additional cleaning. - All reservations that have an alternate guest checking in should make prior arrangements with the resort. - Pets are not permitted and strictly enforced with the exception of Service Animals. - $4.50 nightly city tax inlcuded in booking fees, - A photo identification, credit card for $100 security deposit and a nightly rate of $23.95 pre taxed resort fee will be required at check-in (cash is not an acceptable form of deposit). - Resort Fee includes WiFi, indoor/outdoor pool, hot tub, pool table, seasonal ping pong, seasonal BBQ area, business center computer/internet and boarding pass printing. This property charges a mandatory resort fee due at check-in. Please check listings for details. Rates subject to change. Click "Book it Now" for rates and availability. Reservations may be cancelled up to 8 days prior to arrival. A cancellation fee of 25% of the reservation will be charged. Cancellation requests made 7 days or less prior to arrival are non-refundable.